If you need more muscle for hauling and towing big loads, it’s time to step up to a heavy-duty pickup truck. 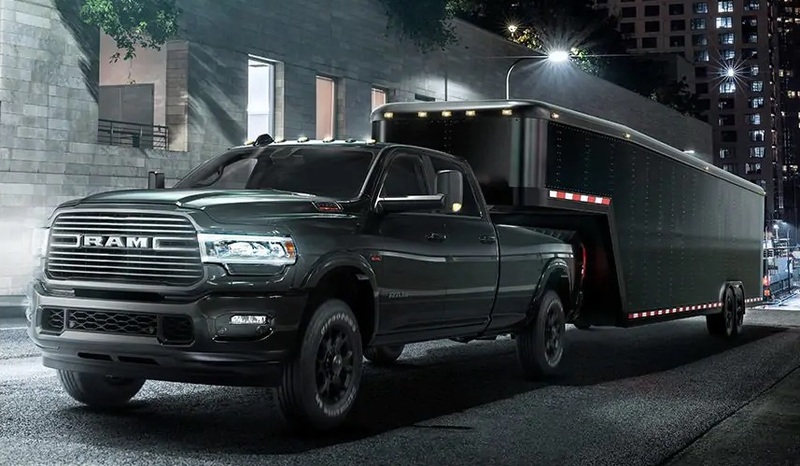 The 2019 Ram 2500 is specially built for handling a serious workload. Although the new Ram 2500 is tough, you can also take advantage of its luxurious ride. Premium features, such as heated and ventilated seats, enable passengers to experience the ultimate comfort on the road. Your local RAM dealer serving Amityville Long Island Huntington Long Island NY also offers a long list of other exciting upgrades. To find out how this heavy-duty workhorse fares against the competition, check out this 2019 RAM 2500 vs 2018 Ford F-250 comparison. The 2019 RAM 2500 gives you three capable engines to choose from. Even the base Hemi V8 engine pounds out 383 horsepower and 400 pound-feet of torque. Meanwhile, the larger 6.4L Hemi engine develops 410 horsepower and 429 pound-feet of torque. If you need to tow an especially heavy load, opt for the monstrous Cummings diesel engine. It can produce 370 horsepower and up to 800 pound-feet of torque. Unfortunately, Ford gives you only two engines to choose from. Furthermore, only the RAM 2500 offers a traditional manual transmission. The diesel-powered RAM 2500’s manual gearbox gives it an especially sporty feel. You can’t experience the thrill of shifting gears with the 2018 Ford F-250. No other truck in the segment delivers a more engaging performance than the RAM 2500. Security RAM invites you to come take a test drive! 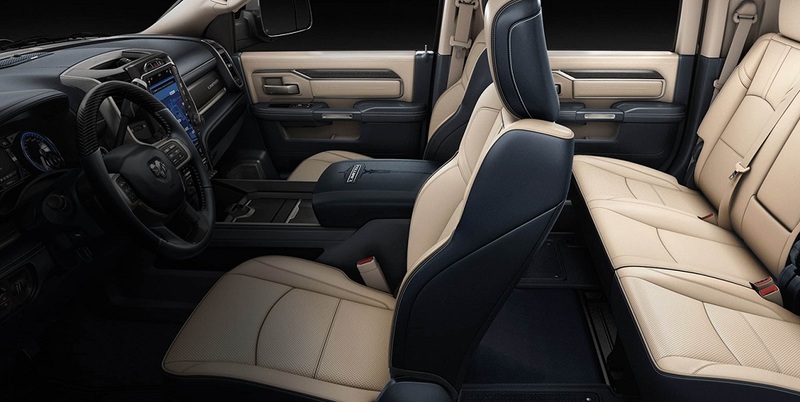 On the inside, the 2019 Ram 2500 gives you a lot of space to stretch out. If you need to haul around your family and friends, choose the RAM 2500 Mega Cab. Four full-size doors enable your passengers to easily climb aboard. You will also love the RAM 2500 Mega Cab’s spacious backseat. It provides significantly more legroom than the Ford F-250 SuperCrew cab. You also can’t forget about the RAM 2500’s luxuriousness. It feels just as plush as a premium luxury sedan. 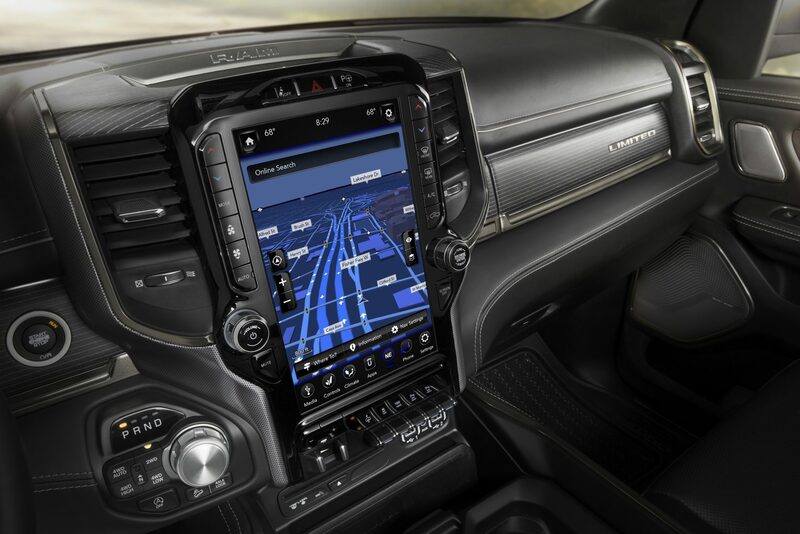 RAM’s Uconnect infotainment system is among the best. Apple CarPlay and Android Auto enable you to easily link to your favorite smartphone apps. A 4G Wi-Fi spot allows all of your passengers to access the web. Some of the other goodies include a 10-speaker sound system, heated rear seats, and a cargo-view camera. Although the RAM 2500 is a big pickup, it feels like a much smaller vehicle on the road. Precise handling makes the RAM 2500 a blast to drive. Whether you’re riding around in Long Island New York or taking a trip across the country, expect the new RAM 2500 to inspire you with confidence. Upon taking a curve, you’ll immediately notice the RAM 2500’s balance. Rear coil springs enable this truck to deliver an athletic performance. Don’t expect the 2018 Ford F-250 to feel nearly as agile. Class-leading ride comfort gives the RAM 2500 yet another advantage over the Ford F-250. Its suspension does an admirable job of soaking up rough patches of pavement. If you do a lot of towing, consider opting for the RAM 2500’s self-leveling air suspension. It automatically lowers the truck at highway speeds to promote enhanced stability. No other pickup in the segment offers this exclusive feature. For more details on the RAM 2500’s special features, contact your local RAM dealer serving Amityville Long Island Huntington Long Island NY. While the RAM 2500 is a tough truck in its standard form, the beefed-up Power Wagon model is especially rugged. It’s designed for the drivers who regularly travel off the beaten path. Bilstein off-road shock absorbers enable you to confidently tackle rough terrain. Meanwhile, reinforced skid plates help keep the undercarriage protected at all times. When traveling in challenging environments, an integrated winch gives you an extra peace of mind. Some of the 4WD-equipped Power Wagon’s other upgrades include all-terrain tires, tow hooks, and electronic differentials. While the F-250 may perform well in the snow, it can’t match the RAM 2500 Power Wagon’s legendary off-road prowess. The RAM 2500 is the ultimate driving machine for serious adventure seekers. Even years from now, the new RAM 2500 will still look stunning. Its ageless styling will definitely withstand the test of time. Although the F-250 is an attractive pickup truck, don’t expect to be wowed by its appearance. The new Ram 2500 has a far more commanding road presence. Everyone will notice the RAM 2500’s bold front fascia. A signature cross-hair grille and chiseled bumper accentuate this truck’s brawny styling. While the base Tradesman model is great for everyday commuting, a number of appearance upgrades are available. Projector headlights and LED taillights are found on the higher trim level. Featuring a special monotone paint job, the range-topping RAM 2500 Limited certainly demands a lot of attention on the road. You can also take advantage of the special-edition models. Blacked-out headlamps and body-color bumpers help the Tungsten model to truly stand out from the crowd. 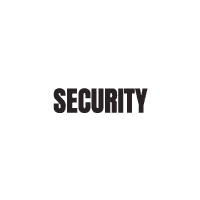 Some of the beautiful paint colors available as Security RAM include Blue Streak Pearlcoat, Delmonico Red Pearlcoat, Black Clearcoat, and Black Forest Green Pearlcoat. 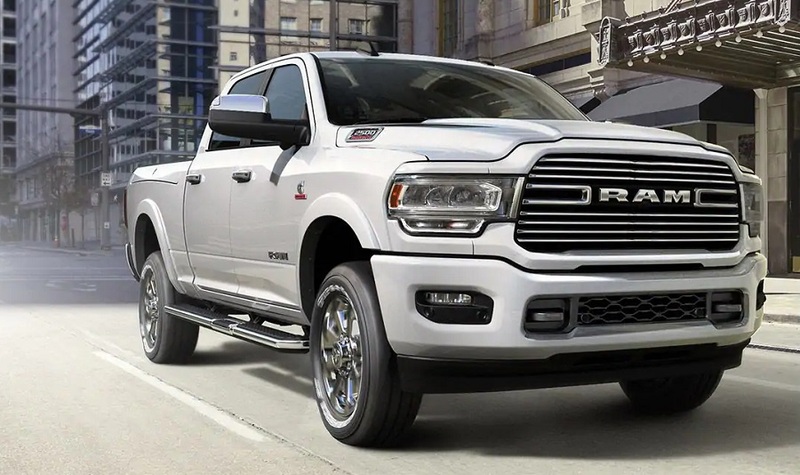 As you can see in this 2019 RAM 2500 vs 2018 Ford F-250 battle, the RAM 2500 is the top heavy-duty truck in Long Island New York!